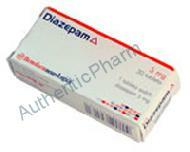 Diazepam is used for: The management of anxiety disorders. It may also be used to treat agitation, shakiness, and hallucinations during alcohol withdrawal and to relieve certain types of muscle pain and other disorders as determined by your doctor. Diazepam is a benzodiazepine. It works by slowing down the movement of chemicals in the brain. This results in a reduction in nervous tension (anxiety) and muscle spasm, and also causes sedation. Do NOT use Diazepam if: * you are allergic to any ingredient in Diazepam * you have acute narrow-angle glaucoma, severe liver disease, kidney problems, or a mental state in which contact with reality is lost (psychosis) * you are taking an HIV protease inhibitor (eg, ritonavir) or sodium oxybate (GHB) Contact your doctor or health care provider right away if any of these apply to you. Before using Diazepam: Some medical conditions may interact with Diazepam. Tell your doctor or pharmacist if you have any medical conditions, especially if any of the following apply to you: * if you are pregnant, planning to become pregnant, or are breast-feeding * if you are taking any prescription or nonprescription medicine, herbal preparation, or dietary supplement * if you have allergies to medicines, foods, or other substances * if you have glaucoma or a predisposition for glaucoma, liver problems, lung problems or chronic obstructive pulmonary disease (COPD), muscle problems, depression, suicidal tendencies, a blood disorder known as porphyria, or a history of alcohol or other substance abuse or dependence Some MEDICINES MAY INTERACT with Diazepam. Tell your health care provider if you are taking any other medicines, especially any of the following: * Hydantoins (eg, phenytoin), rifampin, or St. John\'s wort because they may decrease Diazepam\'s effectiveness * Clozapine, diltiazem, disulfiram,HIV protease inhibitors (eg, ritonavir), narcotic pain relievers (eg, morphine, codeine), nefazodone, omeprazole,sodium oxybate (GHB), or valproic acid because side effects such as increased sedation and confusion may occur * Hydantoins (eg, phenytoin), narcotic pain relievers (eg, morphine, codeine), sodium oxybate (GHB), succinylcholine, or tricyclic antidepressants (eg, amitriptyline) because the risk of their side effects may be increased by Diazepam This may not be a complete list of all interactions that may occur. Ask your health care provider if Diazepam may interact with other medicines that you take. Check with your health care provider before you start, stop, or change the dose of any medicine. How to use Diazepam: Use Diazepam as directed by your doctor. Check the label on the medicine for exact dosing instructions. * Take Diazepam by mouth with or without food. * If you miss a dose of Diazepam and you are taking it regularly, take it as soon as possible. If several hours have passed or if it is nearing time for the next dose, do not double the dose to catch up, unless advised by your health care provider. Do not take 2 doses at once. Ask your health care provider any questions you may have about how to use Diazepam. Important safety information: * Diazepam may cause drowsiness, dizziness, or blurred vision. These effects may be worse if you take it with alcohol or certain medicines. Use Diazepam with caution. Do not drive or perform other possibly unsafe tasks until you know how you react to it. * Do not drink alcohol or use medicines that may cause drowsiness (eg, sleep aids, muscle relaxers) while you are using Diazepam; it may add to their effects. Ask your pharmacist if you have questions about which medicines may cause drowsiness. * If you are taking Diazepam for seizures, carry an ID card at all times that says you have seizure disorder and you take Diazepam. * Diazepam should not be used in CHILDREN younger than 6 months old; safety and effectiveness in these children have not been confirmed. * PREGNANCY and BREAST-FEEDING: Diazepam may cause harm to the fetus. If you think you may be pregnant, contact your doctor. You will need to discuss the benefits and risks of using Diazepam while you are pregnant. Diazepam is found in breast milk. Do not breast-feed while using Diazepam. Some people who use Diazepam for a long time may develop a need to continue taking it. People who take high doses are also at risk. This is known as DEPENDENCE or addiction. If you stop taking Diazepam suddenly, you may have WITHDRAWAL symptoms. These may include convulsions, tremor, stomach and muscle cramps, vomiting, or sweating. Do not suddenly stop taking Diazepam without first checking with your doctor. Possible side effects of Diazepam: All medicines may cause side effects, but many people have no, or minor, side effects. Check with your doctor if any of these most COMMON side effects persist or become bothersome: Blurred vision; dizziness; drowsiness; dry mouth; fatigue; headaches; incoordination; short-term memory loss; weakness. Seek medical attention right away if any of these SEVERE side effects occur: Severe allergic reactions (rash; hives; itching; difficulty breathing; tightness in the chest; swelling of the mouth, face, lips, or tongue); anxiety; chest pain; difficulty breathing; difficulty sleeping; difficulty speaking; hallucinations; inability to control urination; increased muscle spasms; interrupted breathing; involuntary eye movement; sleep disturbances; stimulation; sudden rage; yellowing of the skin or eyes. Store Diazepam at room temperature, 59 to 86 degrees F (15 to 30 degrees C), in a tight, light-resistant container. Store away from heat, moisture, and light. Do not store in the bathroom. Keep Diazepam out of the reach of children and away from pets. General information: * If you have any questions about Diazepam, please talk with your doctor, pharmacist, or other health care provider. * Diazepam is to be used only by the patient for whom it is prescribed. Do not share it with other people. * If your symptoms do not improve or if they become worse, check with your doctor. This information is a summary only. It does not contain all information about Diazepam. If you have questions about the medicine you are taking or would like more information, check with your doctor, pharmacist, or other health care provider.